On the first Sunday of Lent, Christ led us into the desert, where we found a rainbow of hope: one image of Lent. On the second Sunday, Christ leads us to the mountaintop: another image of Lent. Mountaintops have a romantic reputation, maybe confused with sunsets. A “mountaintop experience” is supposed to be pure bliss. But mountaintops are themselves a kind of desert, a hard assent followed by an empty place and rarified air. And so they too are an image of our Lenten desert. Our first reading gives us one kind of mountaintop experience: the sacrifice of Isaac. In the Old Testament, mountaintops, “the high places,” are places of sacrifice. Here Abraham has a harrowing mountaintop experience, an encounter with God in the desert. It is a place of challenge, a place of aloneness with God, and a place of conquest: where God conquers Abraham, Abraham conquers himself, and finally Abraham triumphs. In that triumph, he recovers his son. Our Epistle, from Romans 8, picks up a phrase from the story of Isaac: “did not spare his own son.” But here we find that God did not spare his own Son. We find that Jesus too has been to the mountain of sacrifice, where in losing everything, everything has been gained. These are rainbow stories, images of Lent. But the main story is the Transfiguration, where the disciples discover Jesus in a new way on the mountaintop. This year, of course, we get Mark’s account – the spiritual testament of Peter. It begins by saying Jesus “led them up a high mountain.” The Greek is even stronger, more like “carried them up.” An interesting contrast to the end of the story where “they were coming down” with a verb that emphasizes their own two feet. We go to the Lenten desert on the wings of an eagle. The Gospel emphasizes that they were “apart by themselves,” a lonely place, where they will see nothing but Jesus. Matthew says Jesus’ face and garment are filled with light. Mark makes it more down to earth: his clothes were like no bleach can make them. Otherworldly, yet Peter emphasizes that it was incomprehensible to them, a revelation of how little they understood. Peter says, “It is good that we are here!” Beautiful, really: Greek’s word for noble and upright is “beautiful.” But Peter bumbles: “three tents: one for you, one for Moses, and one for Elijah” has something of stuttering stupidity about it. “He hardly knew what to say, they were so terrified.” Matthew has the fear in a different place, where they bow down in reverent worship and Jesus touches them. But for Mark, they’re just blown away, completely confused. And so too, where Matthew has Peter reverently say, “Lord,” and “if you want,” Mark has Peter call the transfigured God-man “Rabbi,” and there’s no politeness in his offer, just stuttering stupidity. “A cloud came, casting a shadow.” It’s a nice translation. We are too familiar with the religious-sounding word “overshadowing.” Here it makes a strong contrast: after the bright light of the Transfiguration, there is mystical shadow. Matthew calls it a “bright cloud.” Mark just calls it a cloud, leaving them in darkness. The light of Jesus is more like darkness for the stunned intelligence of St. Peter. And yet in the end, “they no longer saw anyone but Jesus alone” – and Mark adds to Matthew, “alone with them.” Here on the desert mountaintop, Jesus astounds and astonishes and baffles – but he is with us. On their way down the mountain, they talk about what is coming. He tells them to keep quiet about this vision, “except when the Son of Man had risen from the dead.” They don’t know what “rising from the dead meant.” Constantly baffled by Christ – and especially about his call to suffering. The Lectionary stops there, but the Gospel has one more exchange. Baffled about rising from the dead, they change the subject: Isn’t Elijah supposed to come? Can we have more of the exciting part? And Jesus changes the subject back, “Elijah truly does come first and restores all things. And how has it been written of the Son of Man that He should suffer many things and be despised?” You want Scriptural prophecies? I’ll give you prophecy: suffering and persecution. And he adds, “Elijah has indeed come, and they have done to him whatever they desired, as it is written of him.” On the mountain, they encounter the cross. Matthew says that then they understood about John the Baptist. Mark leaves them baffled. And so here is another image of Lent. We go off into the desert, to the mountaintop. And the more we are alone with Christ, the more we realize how little we understand, how deeply he challenges us. Lent is a time for that kind of mountaintop experience, slowing down enough to see how challenging Jesus is. Fasting itself is a new encounter with our frailty and confusion and inability to grasp Jesus. From the heights, we can see how far we have to go. This Lent, how is Jesus humbling you? I started writing this web page, and especially the meditations on the Sunday readings, in part as a kind of solidarity with my seminarian students. I am helping teach them to be priests, and one of the central things they will do – and one of the central things my teaching will help them do – is to preach. I tell my students my least favorite liturgical gesture – even though I know it is often only symbolic – is when the priest begins his preaching by closing the Lectionary. “Enough Bible, now here’s what I have to say!” At least symbolically, I’d like them to preach with their finger on the Lectionary, always leading themselves back into the Sacred Page. I began writing these reflections to see if it’s as easy as I make it out to be. A new priest recently told me that one of the hardest parts of his priesthood is having to come up with homilies for daily Mass. What’s he going to talk about? I thought, let me see what it’s like to try to say something about Scripture, and to talk about grace while I do it. I’ve found it a wonderful experience. Scripture is endless, the depths unfathomable. If priests don’t have enough to say, it’s because they are plumbing the depths of their own shallow minds, not because the Bible has gotten boring. The first few years of this web site I tried to focus on grace, and ended up talking a lot about the readings from my beloved St. Paul (or the other Epistles). These are men who grow taller the closer we come to them. They are wonderful. About a year ago I set myself a new goal, to try to focus on the Sunday Gospels. I had a spiritual intimation, from reading great authors, that the Gospel readings were great. But I wondered if now I’d set myself too hard a task. The real meat, I thought, is often in the Epistle. The Gospels give us lovely images, but beyond picturesque stories, is there enough to preach on? I’m happy to say that the Gospels surpass my wildest dreams. The more I press, the richer they get. I set myself a word count, trying to keep these posts short and readable – but there is so much more to say than ever I could write. A sidenote: I’ve been doing some work on John Paul II’s Theology of the Body. I don’t think people sufficiently appreciate that the whole book, some 600 pages, never goes beyond a commentary on seven verses in Matthew 19. (He does use other parts of Scripture to help him explicate those seven verses – he doesn’t use philosophy.) Or how that focus on Matthew focuses John Paul’s gaze on Christ the Redeemer and the Gospel of grace. For historical reasons, and because of the deficiency of their own discovery of Scripture, Jesus, and grace, people confuse this Scriptural commentary with an older, philosophical work that is radically different and deficient. But JPII’s real witness is his radical devotion to commentary on the Gospels. Perhaps you will be scandalized to learn that I don’t put much prayer into this web site. I do try to have a rich life of prayer, liturgy, and sacraments, and I do try to use the liturgy of the day on which I’m commenting to help me enter in. But what I am proposing here is, you might say, a less prayer-centered approach to preaching. Instead what I use is great Bible software. (I love e-sword, which you can download on your computer, and as mySword on your phone – maybe it’s iSword on Apple? It gives me easy access to various translations and original languages, greatly supplementing my shaky Greek and non-existent Hebrew.) Yup, when it comes to preaching, I would recommend more time with the computer and less time in prayer. I know that sounds scandalous – but let me explain. 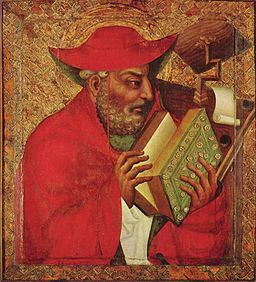 Augustine says something like, “I speak to God through prayer, God speaks to me through Scripture.” God has spoken to us in Scripture. In the liturgy, we say, “the word of the Lord,” but I don’t think most Catholics believe that. Instead, people think there’s some other way around, as if in silence God will speak to you a word that he hasn’t said in Scripture. That he will enlighten you if only you stop reading the Bible. It’s almost funny to see how modern Catholics try to come up with versions of Lectio Divina where they can spend less time reading the Bible. I think that’s incorrect. I think it’s contrary to the teaching of the Catholic Church, to the example of the saints, and to my own experience. Silence is golden, to be sure – but what we need is sufficient silence to listen to his Word, spoken on the page of Scripture. What we need is to get serious about reading the Gospel, digging into the Gospel, seeing how profoundly supernatural is the Gospel’s ability to enlighten our darkness and speak into our emptiness. The only thing I really want this web page to promote is your own love of Scripture. How can you better listen to God’s Word? The first Sunday of Lent, we read of the Temptation in the desert – in Mark’s version, because this is the year of Mark. But we began with the covenant with Noah, and the Lectionary has made a fantastic choice. The rainbow is exquisite. It’s called a bow because it’s a bent line – but in the Hebrew as in the English, bow is a reference to a weapon, a tool of destruction. And it is set in the storm clouds, themselves signs of destruction and flood. And yet the rainbow is something of fanciful, unbelievable beauty and delicacy. (The rainbows we draw are silly. Real rainbows are unbelievably beautiful.) And Genesis makes it a sign, in the darkness, that God will never abandon us. And so the rainbow is like the Crucifix, the tool of destruction now made a sign of hope, darkness turned to beauty. 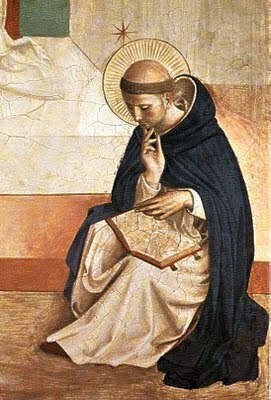 Our Epistle, from First Peter, adds that Baptism, too, is a rainbow, a sign of drowning become “an appeal for a clear conscience,” just as the death of the righteous one becomes hope for the unrighteous, and his death in the flesh becomes hope for “the spirits in prison,” who dwell in darkness and the shadow of death. Lent is Spring. The Latin for the season is Quadragesima – just “the forty days” – but Lent is an Old English word that says that here, when winter has grown long, life is coming again. Fasting itself is a place of renewal and joy and hope. It is a rainbow. And so too is the Temptation of Christ. Mark’s Gospel is wonderful. Matthew gives the Temptation eleven verses, Luke give it thirteen. Mark gives it only two verses – so that the Lectionary this year has to add a second two-verse story. On the one hand, we just need those second two verses to make a respectable reading. On the other hand, the genius of Mark is to move quickly enough to tie the stories together. The Holy Spirit “throws him out into the desert.” It is the work of the Spirit that brings us here. And the interplay of “out” and “into” is lovely: the desert of Lent is both a going away but more deeply a going toward, and a going forward. He is sent to be “tempted by Satan,” to face “the test,” the same word as we pray in the Our Father, “Lead us not into temptation.” That temptation, too, is a rainbow, a fear that becomes in Christ a triumph. Despite Mark’s compression of the Temptation account, he adds to the other two that Jesus was “among wild beasts.” The other two have Jesus talking about Psalm 91, “You shall tread on the lion and adder; the young lion and the jackal you shall trample underfoot.” Mark just points out that Jesus faces both physical and spiritual tests – and conquers. And then, “immediately” (that’s Mark’s favorite word), we’re launched into his preaching. “John had been arrested”: another rainbow, where dark clouds seem to gather and suddenly hope emerges in the person of Christ. He brings hope – he brings good news, “proclaiming the gospel.” And what is the good news? “The gospel of God” and “the kingdom of God is at hand.” It’s not that the storms won’t come – but above the storms, we see the power and beauty and hope of God. On the face of the Crucified shines the rainbow light of the Resurrection. The last words of our Gospel are, “Repent, and believe in the gospel.” Lent is repentance, and repentance itself is a rainbow. The joy of Lent, the spring of Lent, is to know that though we must battle hard against our sins, though we must suffer for a little while, the glory of love stands on the other side. And what a fabulous connection: “Repent, and believe in the gospel.” The phrase is familiar enough to sound normal: one obligation, then another. But the two halfs are opposites. Do you believe the gospel, do you believe the good news of Jesus and the kingdom of God and the triumph of love? Then change your ways! Nervous about repentance? Perhaps you need to rediscover the good news of Jesus. You need to see the rainbow in the storm clouds. What holds you back from true repentance this Lent? A thought for Lent, from the liturgy. I am not defending practice – both rites are done badly most of the time – but the new books I like. That said, there are little details that bug me. One of them was the Kyrie. Before Vatican II it was sung in Greek (I think using some Greek is good and beautiful), three times each instead of two (I like the poetry of that), and without any interpolations, or “tropes.” It’s the tropes I want to talk about. “The rites should be distinguished by a noble simplicity; they should be short, clear, and unencumbered by useless repetitions; they should be within the people’s powers of comprehension, and normally should not require much explanation” (Sacrosanctum Concilium, 34). “For this purpose the rites are to be simplified, due care being taken to preserve their substance; elements which, with the passage of time, came to be duplicated, or were added with but little advantage, are now to be discarded” (ibid., 50). Why, in the midst of this simplification to the essentials, are we cluttering up the Kyrie? And why, especially, are we adding lines that are not directly related to the prayer at hand? 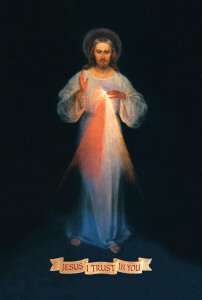 We are crying out to the divine mercy. I love to say Jesus is Son of Mary – I love the rosary! – but that’s not the point here. Keep it simple. But there’s one more part of my annoyance, and here we get to the crux. The medievals too often added to the Kyrie, often long poems. One of the main points of those poems was to develop a Trinitarian interpretation of the Kyrie. The first “Lord have mercy” goes with the Father. “Christ have mercy” goes with the Son. The last “Lord have mercy” is the Holy Spirit. But the Vatican II Mass speaks of Jesus at every turn: Son of God and Son of Mary, Lord have mercy. We’re not talking about Jesus now – I thought. We’re talking about the Father. What are you doing! But then I did some research. It turns out that the Kyrie arises from an old procession where it was all about Jesus. In fact, the Greek Kyrie is connected to that most ancient of Greek Christian prayers, the Jesus Prayer, where one repeats, over and over again, Lord Jesus Christ, Son of God, have mercy on me, a sinner. Which is both Christ have mercy and Lord have mercy. Kyrie eleison, Christe eleison is just another way of digging into the repetition: Jesus, mercy! Jesus, mercy! Jesus, mercy! It turns out, as so often happens, the Magisterium is smarter than I am, and my stubbornness, my assumption that they were screwing things up, is actually yet another call to focus. Of course mercy is a Trinitarian theme. But we begin the Mass by looking toward Jesus, the Divine Mercy incarnate. Keep it simple. The tropes say things like “Son of God and Son of Mary” precisely to put flesh on the words, “Lord have mercy.” It’s not a vague phrase in another language. It’s not even a high Trinitarian formula. It’s the Jesus Prayer: Jesus – mercy; Jesus – mercy; Jesus – mercy. It’s only through Jesus that we have access to mercy and to the Father and the Holy Spirit. This Lent, I wish you forty days of Jesus and mercy. Sorry, I’m not sure what happened last week. I wrote a post, and when I came to post it, it was gone. And just as I am frustrated by my inability, this week we hear of Jesus’s frustration in relation to his own ability and inability. The readings begins with a challenge. The reading from Leviticus tells us of the rules about leprosy. The key line is “he is in fact unclean.” It’s tempting to blame the Old Law for everything, as if Leviticus is cruel. But Leviticus isn’t cruel, leprosy is cruel. It is a horrible, deadly – and until recently incurable – disease. As our Gospel reading makes clear, Leviticus has policies not only for banning lepers, but also for bringing them back to the community. But leprosy is not Leviticus’ fault, Leviticus is merely trying to manage a bad situation. Leviticus doesn’t cause the leper’s isolation, leprosy does. That’s true about the Old Testament’s dealings with sin, too. Leviticus is just trying to manage a horrible situation, and in so doing, it reveals how horrible that situation is. That is the context for this week’s Gospel reading, the last verses of Mark chapter 1 and the first major physical miracle Jesus works. The first words of the reading are “a leper,” and all the horribleness of leprosy comes before us. But the next words (actually the first words in Greek) are “came to Jesus.” Our awful situation meets Jesus. The leper’s words are direct: he kneels down and begs, because he knows how objectively horrible things are – but he professes, “If you wish, you can make me clean.” He doesn’t even ask, he just says, “You can.” That is the heart of faith: to believe that he can. Jesus is powerful. (In Greek, “can” and “power” are the same word.) Hope is the trust that this God who can, does wish to do it. He does wish, he can, and he does. Compare this snorting anger with the emotion just before: “Moved with pity, he stretched out his hand, touched him, and said to him, I do will it.” “Moved with pity” is the great Greek word, splagchnizomai, which sounds like guts and means he felt it in his guts. 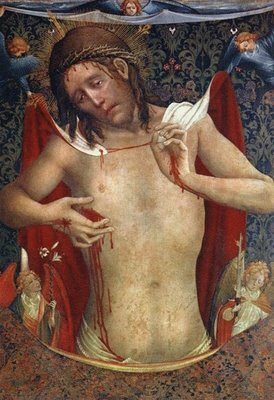 Jesus’s stomach churned with pain for the man. And he didn’t just touch him, he grabs hold, fastens himself to the man. How deeply Jesus feels his love for the man – and his frustration at the stupid way he will respond. The word for what the man does is kerusso. It’s the same word Jesus said last week, “Let us go on to the nearby villages that I may preach [kerusso] there also. For this purpose have I come.” It’s where we get the word kerygma: it means, the thing you preach, the central content of the teaching. But the man doesn’t subordinate things. He disobeys Jesus and preaches his own gospel, a gospel of physical healing. The final line is wonderful: “It was impossible for Jesus to enter a town openly.” For Jesus, nothing is impossible. He can cure leprosy, he can rise from the dead, he can heal our moral ailments. Our reading from First Corinthians gives us the proper moral spin. Paul says that he has become an “imitator . . . of Christ.” That means he does “everything for the glory of God” and seeking the “benefit . . . of the many, that they may be saved.” We need only to be open to letting Jesus transform us, through his preaching (his Word, his Gospel) and through his touch (his sacraments) – and to stop preaching our alternative gospels of worldly success. This Lent, what can you do to set aside false gospels of worldly success and instead let Jesus heal you for the kingdom?